I spent a couple of hours rebuilding my home PC yesterday which isn’t all that different from what I’ve done over the years. Except that it only took a few hours instead of an entire day (or night on a few occasions). In fact, installing Windows Vista Business only took about 30 minutes. That was the easy part. Once I had it installed, I ran Windows Update which found a lot of updates, 75 to be exact. Some of these were for my specific hardware such as video card, sound card and network adapter. I estimate that Vista has spent at least two hours downloading and installing updates. That’s a lot of time but things seem to be running well and I’ve not run into a single driver issue so far. 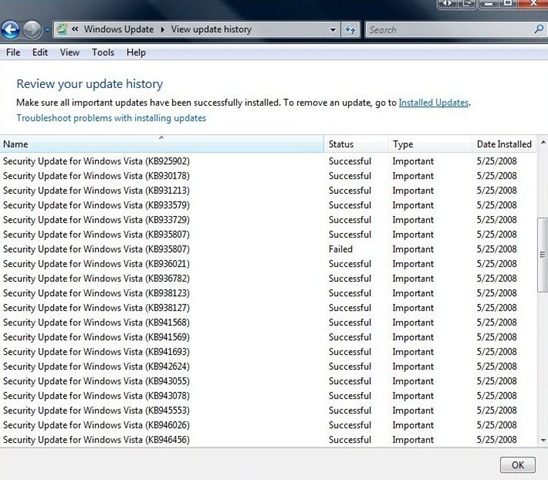 Upon install, expect Vista to find many updates for your system. 7-Zip – Open source archive utility. CCleaner – Cleans up your PC including registry. Clip Diary – Keep a history of your clip board. Even two years ago this list would have been two or three times this size. Products that run from the web are replacing boxed software. When I bought my first computer in college, I had to go to a computer store in order to purchase a game. My children will have no concept of that as everything they need will be a Google search away. Did you notice one program I left off my list? I’m talking about Microsoft Office, and it used to be the first program I installed when I built a new computer. I no longer have any need for it at home. I have to install it at work because most of my coworkers still enjoy passing files around via email which seems about as fashionable as listening to Hootie and the Blowfish. Removing Microsoft Office from your computer is the equivalent of getting a substantial performance upgrade for free. I’ve replace the bloated, buggy, resource hogging Outlook with Gmail and the rest of Office with Google Docs, and I can’t believe I didn’t do it sooner. Besides the speed, stability, no patching, no upgrades, nothing to install nature of Google’s products, I love having access to everything on my phone. I feel like to jumped 5 years into the future when I got rid of Office. When I upgrade my PC and reinstall Windows every few years, I’m sure that list will continue to shrink as more products move to the web. I hope my children won’t have to waste time patching their operating system and updating their software. I wish I were as lucky. Windows Updates is telling me it found 4 more "important" updates it wants to install. Lucky me.